Output file names - can I add date/time ? TOPIC:	Output file names - can I add date/time ? Rather than the default name given to a CSV/TXT output I'd like to put in some default text and then append the run date and time. I guess it's easy when you know how but it's not obvious. Yes of course. For example you can use FlowHeater Parameter or system envirnonement varaibles as part of the output CSV file name. In this case %TEMP% are dynamically replaced with the value of the system environemnt variable TEMP and $DATETIME$ are replaced with the current value of the FlowHeater Parameter “DATETIME”. 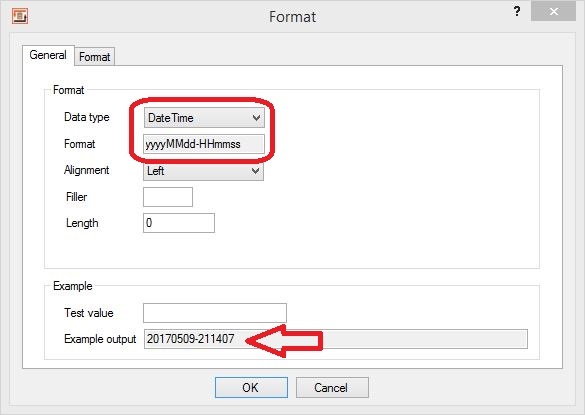 In the Definition you have to set and format the Parameter “DATETIME” by yourself. To do this you need one Now Heater to retrive the current date and time, one String Format Heater to set your desired output format and one Set Parameter Heater to set the value to the Parameter “DATETIME”. In the attachment you´l find a brief example you it´s works. Thanks Robert - however I can't open the FHD as it was created in a Beta Version that isn't available to download (I looked at the definition using NotePad++). I have the 4.0.8.2 version. Have now got the thing working - not always obvious which way/sequence the items should join up. Oh sorry, the attachment has been updatet. Now the current version 4.0.8.2 are used.